Since having received the award for the best interpretation of the Jean Sibelius Violin Concerto and having won second prize at the International Jean Sibelius Competition in 2015, Emmanuel Tjeknavorian has achieved international acclaim. In 2018, Emmanuel Tjeknavorian will be part of the Orpheum Foundation and will give his debut with the Tonhalle Orchestra Zurich under Michael Sanderling. The highlights of the 16/17 season included engagements with the Vienna Symphony, the Frankfurt Radio Symphony at the Easter Festival Warsaw, the Bruckner Orchestra Linz, the Camerata Salzburg and the Bogotá Youth Philharmonic Orchestra under the baton of Andrés Orozco-Estrada. Recital appearances included the Rheingau Music Festival, the Andermatt Classics, the Menuhin Festival Gstaad and the Festival Mecklenburg-Vorpommern’s cycle “young elite”. 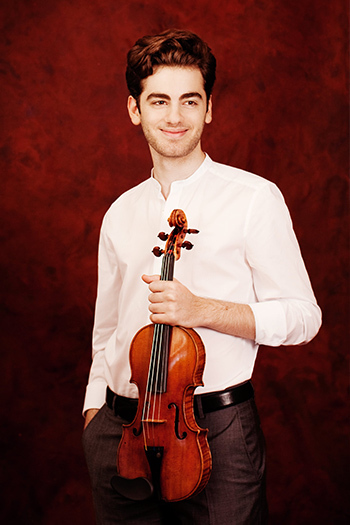 Despite his career being at an early stage, Emmanuel Tjeknavorian has already performed in the Vienna Musikverein, the Vienna Konzerthaus, the Munich Prinzregententheater, the Boston Symphony Hall and the Helsinki Music Centre. As a soloist, he has performed with the Vienna Radio Symphony Orchestra, the Orchestra della Toscana, the Finnish Radio Symphony Orchestra, the Boston Pops Orchestra, the Helsinki Philharmonic Orchestra and the Munich Chamber Orchestra. So far, he has played with such conductors as Cornelius Meister, Keith Lockhart, Hannu Lintu and John Storgårds. Emmanuel had his first public appearance at the age of seven. Since 2011 he has been studying with Gerhard Schulz (Alban Berg Quartet) at the University for Music and Performing Arts Vienna. Emmanuel Tjeknavorian plays an Antonio Stradivari violin (Cremona 1698), generously loaned to him by a patron of the Beare’s International Violin Society London.